TORONTO, ON – November 19, 2019 – There’s one word for the Lexus LC: Amazing. Whether it’s the conventionally powered LC 500 or the self-charging hybrid LC 500h, this prestige luxury coupe is daring in conception, powerful in performance, and true to the spirit of the Lexus LF-LC Concept vehicle that inspired it. For 2019, Lexus offers its signature coupe in a selection of jaw-dropping models and trim levels. The Lexus LC delivers a breathtaking blend of raw power, razor-sharp performance and ride comfort that positions the driver perfectly to hit every apex and enter straightaways with unlimited confidence. Regardless of powertrain, these pure adrenaline machines are ready to launch from 0 to Exhilaration in under five seconds. Lexus designers and engineers worked closely throughout the LC’s development to ensure every component works in harmony, to take full advantage of the LC’s inspired performance capabilities. From the rear wheel drive platform to the wind-cheating chassis and low profile tires, everything serves to ensure that every drive is nothing short of amazing. The LC’s dynamic performance starts with its platform, which enables near perfect front-to-rear weight distribution of 52%/48%, plus an ultra-low centre of gravity. The result is sharp yet exceptionally refined driving. The Lexus LC 500 features a 471 horsepower 5.0L direct-injection V8 coupled to a 10-speed direct shift automatic transmission with shift-by-wire gear lever and AI-SHIFT control with driver mind index. 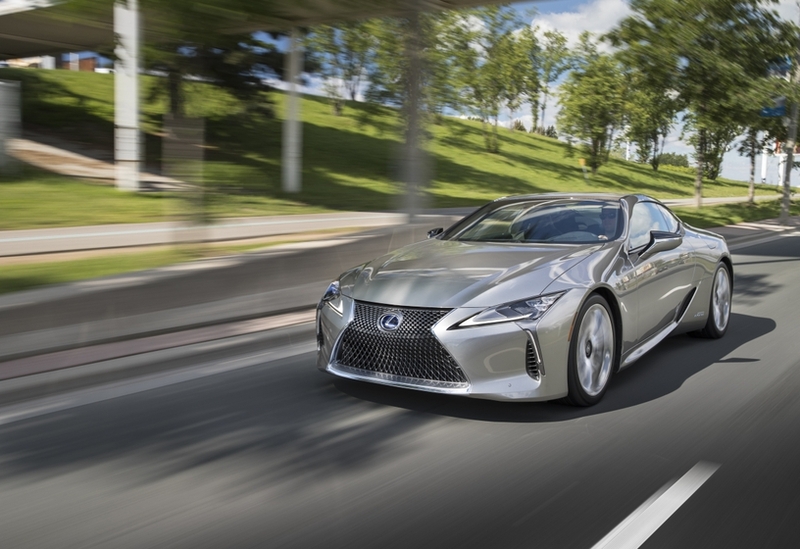 The self-charging LC 500h is built around a Lexus multi-stage hybrid system that generates 354 net horsepower. This is built around a powerful yet efficient Atkinson cycle 3.5L V6 linked to a multistage transmission with 10-speed AT simulated shift control. All LC series coupes feature front and rear multi-link suspension systems with double ball joints on the upper and lower control arms to allow for control of the smallest movements from both driver inputs and road conditions. Meantime, front and rear ventilated disc brakes feature front 2-piece brake rotors and aluminum mono-block brake calipers to deliver reliable stopping performance during spirited driving. While built for performance, the LC series also captures all the beauty of a prestige coupe. With a long wheelbase, compact front and rear overhangs, and a notably low hood, the LC presents an athletic profile. This is set off by a sweeping roofline, sensual curves, and wind-cutting silhouette. Muscular wheel arches emphasize the LC’s imposing stance while large wheels are pushed to the corners to reduce overhang and increase control. Meantime, wheel arch vents enhance aerodynamics and cooling performance – and include aerofins up front, inspired by Formula 1 technology. The LC’s unique lighting signature makes an impression coming or going, including LED headlamps, daytime running lights and cornering lamps, plus multi-layered LED tail lamps that light sequentially to create a unique three-dimensional L motif. Inside, the LC’s cabin is designed to maximize driving pleasure and luxurious comfort. The cockpit is an invitation to high-spirited driving, while passengers relax in an environment that combines elegance and sophistication – including hand-stitched upholstery. Throughout the cabin, many examples can be found of the Takumi craftsmanship for which Lexus is globally renowned. The impressively equipped LC series features Lexus Enform – a multimedia package that combines connectivity, information, entertainment, convenience and next-level peace of mind in one simple-to-use system. Features include Enform 2.0 App Suite, Enform Safety Connect, Enform Destination Assist, and Apple CarPlay compatibility. The LC’s display audio system is built around a 13-speaker Mark Levinson configuration with 10.3” screen, integrated Sirius XM Satellite Radio, Bluetooth® connectivity, and more. A navigation system includes the Lexus Remote Touch interface. Other onboard technology includes a multi-information display, head up display, the Lexus Smart Key System with Push Button Start and Intuitive Parking Assist. Additional standard features include dual zone automatic climate control with the Lexus climate concierge system, heated and ventilated power adjustable front seats, driver and front passenger memory systems, the signature Lexus analogue clock, heated steering wheel with adjustable temperature control, magnesium alloy paddle shifters, steering wheel-mounted controls for the audio and voice recognition systems, and more. The 2019 Lexus LC 500 Performance Package (starting MSRP: $116,250) adds a Torsen limited slip differential, four-wheel steering, variable gear ratio steering, 21” forged wheels, a retractable rear spoiler, front sport seats, an eight-way power adjustable driver’s seat, Alcantara & Leather seating, a carbon fibre roof, carbon fibre reinforced polymer scuff plates, and an Alcantara headliner.